This web site is made possible by the support of the American People through the United States Agency for International Development (USAID). The contents of this web site are the sole responsibility of CDM and do not necessarily reflect the views of USAID or the United States Government. Dusabe G and A Raobelison, JP Nzabonimpa, M Wilson, October 2010. Scaling up Point-of-Use Water Treatment through Multiple Channels in Rwanda. (pdf, 1.8MB) Country Brief. Bethesda, MD, USA: Social Marketing Plus for Diarrheal Disease Control: Point-of-Use Water Disinfection and Zinc Treatment (POUZN) Project, Abt Associates Inc. and Population Services International. MacDonald, Vicki, Justin Buszin, and Njara Rakotonirina. August 2010. 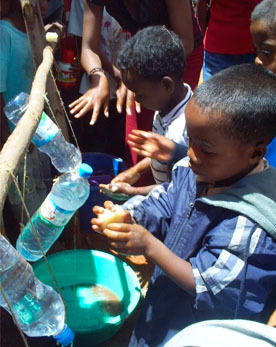 Providing Safe Drinking Water in Benin: The POUZN Aquatabs Program. (pdf, 2.8MB) Country Brief. Bethesda, MD, USA: Social Marketing Plus for Diarrheal Disease Control: Point-of-Use Water Disinfection and Zinc Treatment (POUZN) Project, Abt Associates Inc. and Population Services International. Senator Paul Simon Water for the Poor 2010 Report to Congress (pdf, 1.3MB) - describes U.S. efforts to expand access to safe drinking water and sanitation, improve water resources management and increase water productivity in developing countries. Key Results: In FY 2009, the United States (primarily through USAID and the Millennium Challenge Corporation) invested about $774 million for all water sector and sanitation-related activities in 62 developing countries. Environmental Health Update - July 8, 2010. (pdf) Citations and abstracts of 6 recently published journal articles and links to news updates on water, sanitation, hygiene, indoor air pollution and urban health. Evaluation of Manufactured Wood Stoves in Dadaab Refugee Camps, Kenya. (pdf,6.86MB) Feb. 2010. Berkeley Air Monitoring Group (Berkeley Air) - The purpose of this study was to obtain information on the potential suitability of a new generation of manufactured biomass cooking stoves for refugee and Internally Displaced Person (IDP) environments as well as disaster relief situations. USAID Global Development Alliance. (2010). Safe Drinking Water Alliance: Experiences in Haiti, Ethiopia, and Pakistan; Lessons for future water treatment programs. (pdf, 1.51MB). To address some of the challenges created by lack of access to safe water, in 2004, the United States Agency for International Development’s (USAID) Global Development Alliance (GDA) brought together Johns Hopkins Center for Communication Programs (CCP), Population Services International (PSI), CARE USA, and Procter& Gamble (P&G) to create the Safe Drinking Water Alliance (SDWA).